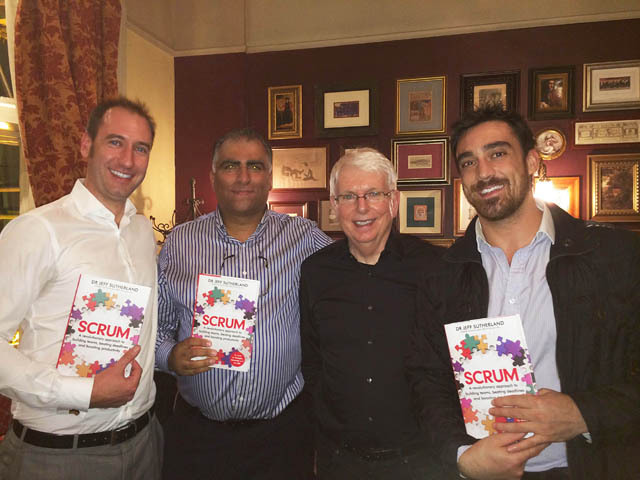 Co-creator of Scrum comes to Town! When Dr. Jeff Sutherland, the co-creator of Scrum, the World’s leading Agile process framework, announced that he would be coming to Town to launch his new book, wild horses wouldn’t keep us away! Pictured above: Chris Boyce, Carl Adamson, Jeff Sutherland, Sam Rowley. 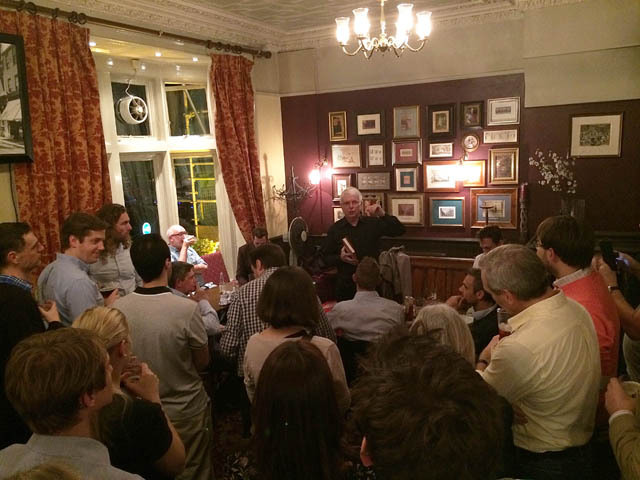 It was a relaxed and informal evening, where after sampling some quality English beer (real ale! ), Jeff gave an interesting talk on the future of Scrum and how it is gaining ground, not only in IT but also in other industry sectors such as retail, engineering and even education. Most notable was the rising popularity of Scrum in schools where eduScrum is gaining ground in the Netherlands. Students are given freedom to learn at their own pace as part of a Scrum Development Team. Students take it in turn to be the Scrum Master. The teacher is the Product Owner and they set the assignment for the students. The students then work with the teacher to break the assignment down into Product Backlog Items and carry out estimation, in story points by playing Agile poker. The team use a Scrum board and self-organise a Daily Scrum, supervised by the Product Owner, who by the rules of Scrum, cannot speak unless asked to do so by the team (the students!). The students constantly look for opportunities to self-improve their learning experience. Overall, the students are consistently achieving 10% higher results than those receiving traditional teaching methods. Plus there are additional benefits, not least that the students are better prepared for working on projects in the real world. The world that is rapidly becoming Agile. Teaching Agile in schools and colleges is something that we feel passionate about at Agilistix. Watch this space for more news on that subject. We highly recommend that you pick up a copy of Jeff’s new book: Scrum: A revolutionary approach to building teams, beating deadlines and boosting productivity. It’s an informative and entertaining read. We’ll provide a review of this book later. 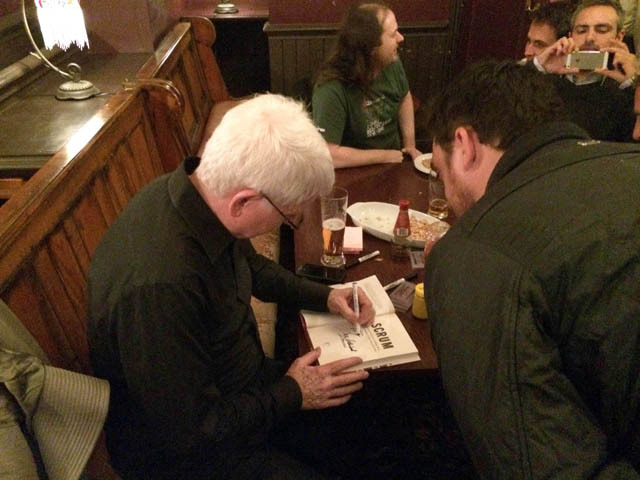 We would like to thank Gabrielle Benefield of Evolve Beyond for organising and inviting us to Jeff’s booking signing event. Oh, and also for the beer!